THE WESTERN SLOPE IS A SPECIAL PLACE. Colorado’s western slope’s greatest assets lay in our public lands and waters. Our livelihoods have been built on the availability of clean water, healthy forests, rich geology, and fertile soils. As our traditional economies have been supplemented by industries like organic farming, recreation, and tourism, our public lands and waters continue to support our way of life. 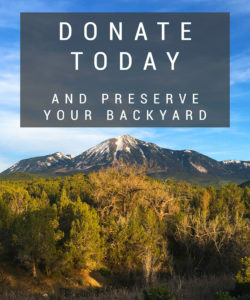 The Conservation Center is dedicated to protecting and enhancing these resources and access to them to ensure that the Lower Gunnison Watershed remains healthy and intact for generations to come. The Western Slope Conservation Center has worked for the last 40 years to ensure the health of and access to our local public lands. The Grand Mesa, Uncompahgre and Gunnison National Forests are a combination of separate National Forests located on the western slope of the Colorado Rockies. These three combined Forests cover 3,161,900 acres of public land in the central and southern Rocky Mountains. The Bureau of Land Management (BLM) has issued a sprawling resource management plan for 567,000 acres of its public land, mostly in scattered parcels along the Colorado and Eagle rivers, but also in the valley between Aspen and Glenwood Springs. A combination of warm winters and low precipitation has proven deadly for many of our tree species and proven devastating.Within the last decade, these forests and many others have been under attack from a variety of insects and diseases.